The morning of my 35th birthday got off to an early start as my parents called to wake me up at 6:30 and wish me a happy birthday. It was nice to hear from them. I think my father was a bit impressed that he had successfully dialed international long distance (“so many numbers!”) and we had a nice conversation. We had originally planned to get up a bit earlier and after the phone call we rose, got cleaned up, and headed to a local wat or temple. Actually, it wasn’t all that local. We took the Skytrain to the other side of town, to a wat located behind the Century Park Hotel (Paul will remember this hotel). 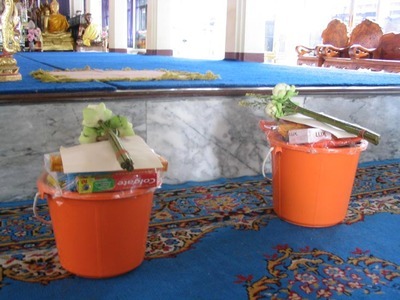 Part of Thai Buddhist tradition is the concept of “making merit“. This can be done anytime, but it is customary to do it on your birthday and on other significant occassions. So we went to the wat and I donated a bucket full of possessions that the monks can use such as toothpaste, soap, rice, water, etc. Then I receive a lengthy blessing (in Pali, the Sanskrit-derived language used by monks for religious ceremonies, complete with a spashing with holy water. This particular wat is located in the midst of a community market and, despite being located almost smack-dab beneath an expressway, is still an example of the central role the temple plays in the community’s life. In another hall at the temple, preparations were being made for a funeral. Another area holds a school. And another is where young men prepare to enter the monkhood as novices, for a day, several weeks, months, or even a lifetime – as all Thai Buddhist men are expected to do at some point. “Loi Krathong” is traditionally performed on the full moon night of the twelfth lunar month, which usually falls on some day in November. The floating of a ‘Krathong’ – a banana–leaf cup – is intended to float away ill fortune as well as to express apologies to Khongkha or Ganga, the River Goddess. Some believe that the ritual is meant to worship the Buddha’s footprint on the bank of the Narmada River, while others say that it is to pay respect to Phra Uppakhut, one of the Lord Buddha’s great disciples. We’ll go down to Chulalangkorn University (Tawn’s alma matta) this evening, where there is a large lake on the campus, to place our own krathong in the water and cleanse ourselves of any ill fortune. This is as big a celebration as New Year’s Eve is in the States, so I’ll try to get some pictures of it. This entry was posted in Expat Life, Personal and tagged Birthday, Expat, Thailand by christao408. Bookmark the permalink. Jason – thanks for the compliment. It you are only as old as your attitude then I’m either 67 or 23. Depends on the day.